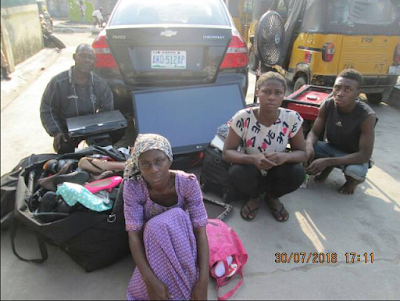 18-year-old Tega Teddy, his parents, Mr. Uroye Teddy, 45, and Mrs. Margaret Teddy, and his girlfriend Karima Edom, have been arrested by the police officers attached to Lagos State Police command for stealing. “When Mrs Folashade Odunuga of No. 8 Ade Onitiri, Harmony Estate, Langbasa, Ajah, embarked on a 3-month vacation which commenced on May 27, 2018, little did she know that her apartment would be broken into and her household property including her car, stolen by eighteen-year-old Tega Teddy aided by his parents Mr. Uroye Teddy, 45 years old and his mother Mrs. Margaret Teddy. “Also fingered in the offence is Tega’s girlfriend, one Karima Edom, a close neighbour of the victim who allegedly passed information of the victim’s absence from home to her boyfriend. “The stealing had been going on for weeks until the victim’s househelp, one Eniola Abisola visited her mistress’ house and discovered that a lot of items were missing. She couldn’t understand how the thieves entered the apartment as all doors to the house remained closed. “She immediately alerted the Divisional Police Officer (DPO) in-charge of Langbasa Division, SP. Adaobi Okafor who mobilised her detectives to check on all in the neighbourhood whose names are in the station’s watch list. “When the detectives checked on Tega, they saw the stolen Chevrolet Aveo saloon car with registration number AKD 512 AP, parked in the front his parents’ house at New Osho layout, Langbasa. He was promptly arrested. “During interrogation, he revealed that he entered the victim’s house through the ceiling and gradually, he began to pack the household items to his father’s house. He narrated that his mother helped him to hide the stolen items in an uncompleted building while his girlfriend Karima, hid some in her house. The suspect, Tega, further revealed that his father went with him to the victim’s house to tow the aforementioned car. It was seen that Mrs Margaret Teddy had put the stolen properties for sale. “Exhibits recovered from the suspects include: Chevrolet saloon car reg no. AKD 512 AP, 42 inches flat screen TV, LG Home theatre sound system, electric generator, one standing fan, 5 leather bags, an iPad baby shoes and other personal items.